The Apple rumor mill seems to be spinning faster than ever, and more leaked hardware is hitting that tells us pretty much exactly what the iPad 3 will be like. 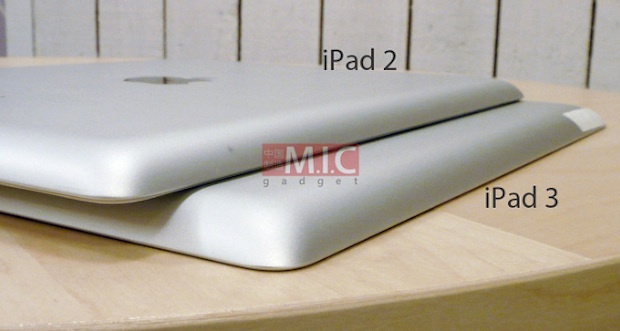 NextMedia has gotten hold of what they’re saying is an iPad 3 rear shell, and photos of this thing are all over the web. It’s consistent with previous rumored hardware, but for the first time it gives a true sense of what the iPad 3 will look and feel like. The MICGadgets website has yet more examples of the hardware, and they’ve also released photos. What’s it like? Pretty much like the iPad 2. it’s so very similar that, based on the photos, it’s unlikely to be an iPad knockoff (there’s no SD slot, no USB socket or other non-Appley stuff), so we’re inclined to see it as the real thing. But it is fatter (thicker), by maybe around 1mm, and this greater depth means the back face of the device is slightly more chamfered in. So far, nothing major…except that many iPad 2-compatible pieces of hardware (things like stands and extremely form-hugging covers) won’t fit. That’ll cause all sorts of silly noise online for a while, with accusations that Apple is screwing third-party manufacturers. But it does mean that the internals of the device have changed significantly–Apple’s too design conscious to make this change otherwise, and there already was a deal of spare room inside the iPad. That means either a bigger battery, different hardware to deal with connectivity for LTE, or a bigger camera module (or various combinations of these). The camera certainly does look to have a larger window, but we’re skeptical Apple would opt to put in a higher-resolution camera that adjusted the iPad’s profile to this extent. It means a bigger battery, to deliver more oomph for longer life, or perhaps to power energy-hungry LTE hardware or a much higher resolution screen. That screen is now very well leaked. It’s definitely coming with four times as many pixels as the current iPad–meaning its resolution is 1,536 by 2,048. That’s incredible–and your brain may pop at the idea of playing an updated Infinity Blade on this thing (the game app Apple used to wow audiences about the iPad right back at the start). It also reveals how Apple will try to combat Amazon. The iPad 3’s screen will likely deliver text in e-books that is so very sharp and contrasty that it will make e-ink seem dim and inferior, which deals nicely with the original Kindle e-readers (although they may still work better in direct light). And the Kindle Fire’s screen is just 600 by 1024 pixels, which will seem incredibly weak compared to the iPad 3’s. If Apple, as rumored, also opts to use new IGZO tech in the LCD, it’ll also outperform most other tablet LCDs out there. 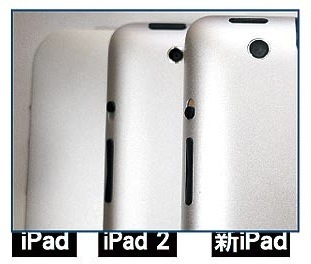 A leaked photo of what’s said to be an iPad 3 motherboard is causing some online discussion, since it’s clearly labelled with an “A5X” system-on-a-chip, rather than the expected A6 ARM-based processor. Could the A5X be a quad-core version of the A5? Could it simply be an A5 updated and clocked to much higher speeds? At this point it’s all speculation. It’s possible the chip is a development of the A5 in the same way the iPad 3 would seem to be a development of the iPad 2, but we’re thinking that super-high-res screen needs more beef than an updated chip can manage. The photo may be of a predevelopment prototype, or Apple’s chosen a strange naming convention. Tallying with our thinking, and what an Apple insider told Fast Company last year, it’s now definitely thought Apple will release an iPhone 5 in the September/October window. That’s a little under a year since it revealed the iPhone 4S and disappointed many who were expecting a new look and feel–and it’s consistent with the effort Apple must be making to perfect the hardware. Apple’s also said to be planning a big-scale overhaul of both the iTunes Store and the App Store experience. While this is a rumor, it’s welcome news–Apple needs to pay attention to these two pieces of software that have grown to encompass uses that they weren’t really designed to cope with from the start. The iTunes Store is feeling old and clunky, and the App Store faces criticism for making it hard to surface new or better apps–despite being on the verge of serving up its 25 billionth app. Would a bigger iTunes overhaul come alongside these changes? Arguably that’s overdue too… but as of now, the rumor winds don’t carry such whispers. From a leaked image, it looks like Microsoft is about to sleep with the enemy and launch Office for the iPad. Its own Windows 8 tablets are expected later this year, which puts the Office team at loggerheads with the Windows tablet team–with such in-fighting a famous issue for MS. But Apple’s lead in the tablet field is all but unassailable for the near future, and Microsoft’s exec team has probably decided that it can turn a shiny penny (or several billion) by selling its apps to execs who’ve bought an iPad but still yearn for the familiar embrace of their traditional business productivity software. MS detractors will shiver at the thought, but it will seriously dent allegations the iPad is a consumption-only app, it could sync nicely with MS’s plans for an iCloud-rivaling SkyDrive app on the iPad, and the entire rewrite needed for Apple’s OS would at least allow MS’s coders to ditch some of the more famous Office unpleasantries. UPDATE: Apple has just bought young firm Chomp to help radically rejigger the way search works in the App Store and possibly in iTunes itself. Looks like some of the rumblings about Apple’s plans for its online commerce properties were current…which makes us wonder what move comes next?